A turbulent month is coming to its end, as quite a few new features were introduced, and we are currently busy tying up a few loose strands from before. We will send out the focus test invitations for the first group of testers pretty soon, so keep an eye on your mailbox. For the playtest, we had to do some additional polishing on our development version of the game, which lead to a slight delay to early March. We plan to bring you the long awaited update regarding the writing contest next week; in addition, we will present you the finalists for the upcoming island voting. It was not an easy task for us to select the finalists from over 100 amazing entries! After our big introduction to Anno’s residential tier system, this week’s DevBlog will bring the stars of the first tier to the stage: enter the farmers of Anno 1800. To see that the blog resonated with so many of you made us happy and we are looking forward to showing you some of the features in action in the next AnnoCast. Community Many of you are curious how exactly the trade routes work between sessions. We have an island in session A, which produces a good currently needed in Session B. We start with creating a route to send the ship to pick up the goods in session A. When loaded, it will travel to the border of the map in order to leave session A. It will now take some travel time until it finally at the map border of session B. I cannot give you more specific details about the exact length of the travel time as of yet, as we are still working on the right mixture between realism and good gameplay flow. Ships should need some time to travel across the ocean but it should not take too long to affect the gameplay negatively. fabian_eiter Will I need to create residential buildings on every isle separately in order to generate the needed workforce for my production? Dirk: The short answer: No. The more detailed explanation: Generally speaking, you will always need residential buildings to generate workforce, like farmers taking care of the crops. However, it will be the case that some of your islands do not need your entire workforce. You will be able to transfer such workforce overhead to your production isles. It is up to you whether you want to generate your workforce on your production islands or to transfer them within your empire. We will provide more in depth details about the workforce system in a future blog. Annorevolution The high tier residential buildings from early screenshots seem to be 3×6 in size. Does that mean that these kinds of buildings will not be in the release version of the game? How do you plan to create an organic looking cityscape? Basti: Higher tier residential buildings will connect to create dense house facades, similar to the system from Anno 1404. That allows us to create the look of connected big housing complexes based on several smaller units. The screenshots, which show a modern metropolis in the 19th century, are representative of the look we aim for with the release version of the game. Gxy12 Will the new workforce system require that you use lower tier residents in higher tier production buildings, or even buildings which rely only from workers from lower tiers? Basti:Workforce will not be limited to their specific tier, so you will be able to utilize your lower tier workforce for some production buildings from a higher tier. For more details about the workforce system, keep an eye on future DevBlogs on the Union, as this topic will get some more coverage in near future. otacon2002: What is going on with the trains? Do you have any information how trains will work? Basti: We are working on it to tackle some of the most burning topics in near future. We wouldn’t do the bigger features a favour if we would just drop some details in a community Q&A. 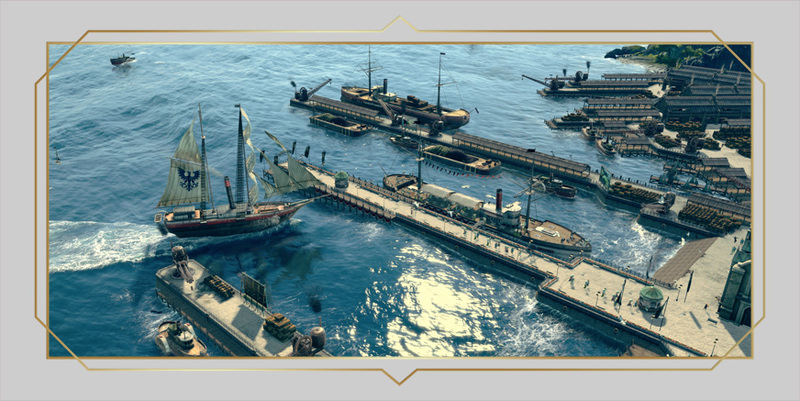 We hope that we will soon be ready to give you some insights on Anno 1800s trains, a topic where the team is really curious about feedback from the Anno Union. In most games, progression usually means acquiring new skills for your persona, raising stats and expanding your arsenal. In Anno, your residents are at the heart of gameplay progression, as levelling up your population gives you access to a growing catalogue of new buildings and opens up new and more complex production chains. Your city will advance through an era of change and wonders, while you improve your own management skills to become a masterful city-builder. With this series of DevBlogs, we put the residential tiers and their gameplay role for Anno 1800 into the spotlight. Making the start are Game Designer Christian Schneider and Lead Artist Manuel Reinher, introducing the fundamental ideas behind Anno’s residents. Anno’s core gameplay idea is the concept of “fulfillments of needs”, where you have to provide the infrastructure and amenities for your citizens in order to advance. Residential tiers also work as a threshold, which determines how far you have progressed in the game, similar to the character’s levels in other games. Reaching the next tier is a rewarding milestone, giving you access to a variety of new buildings to construct advanced production chains. Similarly to your production, your society will advance with each level and their demands will become harder to fulfill – a natural difficulty curve. Your population serves also as an indicator of your skill as an Anno player. If you just advance in a new tier, only a few basic buildings will be available to kick off your new production but as the amount of residents in a specific class rises, more and more buildings will become available. In Anno, every single building has not only a distinctive visual character; it also has its own gameplay aspect and interface elements. Buildings of each tier become a tool for environmental storytelling: you click on a tier home and the farmer tells a story from his daily life, and public buildings like the market become a stage for visual feedback. From a gameplay perspective, public buildings play an especially important role, as they are the center of your attention. Their influence on your city district is an important gameplay indicator, which leads players to have a close eye on your pub and other public buildings. Because of their influence, city districts are often built around a center of public buildings and other eye-catching constructions. There is also an important change for Anno veterans out there: every citizen tier has its own workforce type, which is required to run the specific production buildings of that tier. If you think about it, it makes sense: farmers take care of rural production, while the working class was born out of the demand from factories for specialized workers. That means that you have to make sure that sufficient workforce of a specific tier is available to run the production of said tier. This change provides a new layer of complexity when designing and managing your city and results in a way more interesting and natural cityscape. When cities grew to metropoles and workshops became factories, our society changed drastically. While aristocrats still fought over colonies in the backrooms of glamourous palaces, the new working class would go on to become the foundation of our modern society. For Anno 1800, the depiction of the century and especially the evolution of classes and society as a whole are important aspects of our artistic vision. 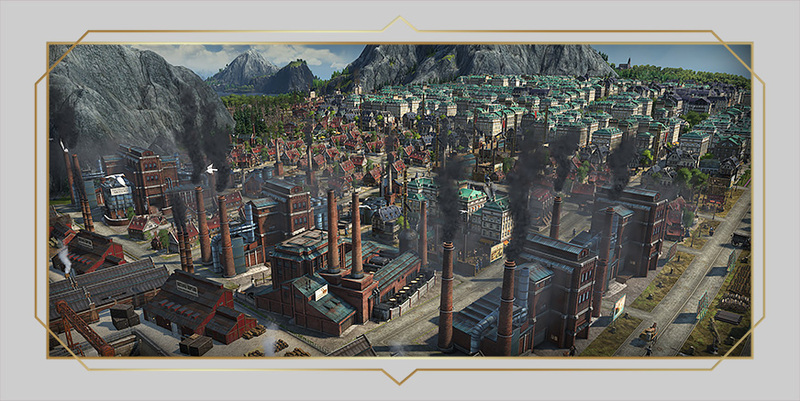 Every new match in Anno 1800 will be a romantic journey through history, starting with the beginning of the industrial age all the way to the end of the 19th century. Every house, public and even production building for each tier should convey a certain character, and their design should be our way of telling the story of the people of that era. Every single tier is a specific snapshot of a different class and with that, shows how society advanced during the industrial age. A lot of thought went into the different buildings and subsequent events to represent their residential tier properly. Farmers and agriculture where still important during that time but they stood as a remnant of an old age. Their houses are not streamlined by modern pragmatic architecture, allowing them to have a personal touch while you will also able be able to notice that progress is coming to a halt for their production buildings. To support the working class on the other hand, cities needed to make accommodations quickly available and the modern city life changed personality and habits. At first, your lower tier settlement has a more natural but less structured look and over time, as order and structure will find their way in the metropolis you are aspiring for. That is the special rewarding feeling of an Anno game, when watching how through your hard work, a small farming village becomes a large city with beautiful higher tier districts, impressive factories and stunning cultural buildings. Not only the 3D models, the right palette of color and material also defines look and feeling of a tier. During the industrial revolution, cities grew larger and architecture adapted in order to accommodate the masses of citizens who needed to work in the growing factories. Modern technologies like assembly conveyors pushed mass production, while steel beams allowed factories and other buildings to expand, and that changed the urban environment drastically. Residential buildings take up space on your island and with that, compete with your production lines over available space. This creates the classic Anno puzzle: how much space is available and how do I allocate it? To represent the setting properly, we realized that things have to get bigger for a proper representation of that era. In Anno 2205, residential buildings where mostly 3×3, 5×5 or 6×6 depending on your citizen tier and region. While the 6×6 fields in Anno 2205 made it easier for us to create organic cityscapes, it limited the amount of buildings a player could place. In Anno 1800, islands will be bigger and can hold more assets compared to previous titles. With all residential buildings now consuming only 3×3 tiles, it allows you to not only ramp up the amount buildings you can create significantly, it also enables us to make use of bigger production buildings. To fit the style of that era, we wanted these factories to be clearly bigger in size than other buildings; your modern production districts should be impressive feats of city design and modern architecture. The residential tiers are a substantial part of Anno’s atmosphere, artistic design and gameplay created with passion and love for the franchise and setting. But we won’t just close the book on that topic, stay tuned as we get even more into detail and showcase the different tiers with their historical background, design and their production chains. How important is the depiction of that era and the detail work, which goes into the different tiers, for you? We are curious how our take on that setting resonates with you and if you like the changes to the classic Anno formula to add challenge and give your city a more natural and realistic look. It might be the coldest month of the year, but neither the development nor the Anno Union suffers from the winter blues. As announced, we will relentlessly bring you weekly DevBlog’s about fundamental core mechanics of the series. This week, you can look forward to the start of a whole series about Anno 1800’s residential tiers. We will highlight the artistic vision behind their design, their importance for the setting and their importance for Anno’s gameplay! Talking about passionate topics: we want to say thanks for everyone participating in the island contest. We got flooded with a crazy amount of amazing entries and our team is currently going through every single one of them in order to present you the finalists as soon as possible. A big thumbs up from the team! Some time has passed and we will announce the winners of or previous writing contest soon. We made our choice already and had a cool idea how we could properly present the winning stories. This caused a slight delay but rest assured, we lift the curtain in an upcoming Union Update. Another update about the next AnnoCast and the Community Roundtable is on the horizon. We got plenty of feedback about the first roundtable and we guess that many of you look forward to another evening chat between the Anno Union and the development team? Before we head over to the community Q&A part of the update, we like to give you some general information about the focus playtest: We all know that you can’t wait to hear more about the tests, specifically their exact starting date. Please keep in mind that the tests are under a strict NDA, and therefore, we won’t provide full coverage on the tests. However, we will briefly talk about the focus-playtests in blog articles and let you all know when they invitations for the first group are out. Resources are important for almost all strategic elements of the game, so please give us adaptable and varied settings when generating an endless-match. Why shouldn’t it be possible to just define the amount of resources? “Unlimited – high – low” would be sufficient to create a rich variety of scenarios and end the endless discussions about the pros and cons of unlimited lodes. Sebastian: Limited lodes would make the flow of the game much more convoluted and interrupt the gameplay, especially in the already more complicated late game portion of a match. Furthermore, you will be able to claim a high amount of islands across different sessions in Anno 1800. Micro managing every single one of them could end up being quite a daunting task. Let’s say we have limited lode capacity, that means we would need to create interesting systems to refill the resource lodes. Just using “a bit of cash” to refill them would not be enough, because think about it: how wants to be frequently reminded that one of your dozen mines depleted just to press a simple button. That is neither challenging nor fun. We would be able to create a nice system around it, but it would cost us time developing said feature. Even if it looks like a minor feature, we would need allocate time from other content to realize it. Up to this point, the feature just was not that important for us in order to push something else back. The plenty of feedback we got in the last DevBlog made us realize how important a complex lode system is for the community. For that reason, our team will start an internal discussion based on your feedback. It might be worth to think about making content, which is matter of controversy in the community, just an optional part of the game. That would allow everyone to create his or her individual game experience. In that case, you would also need to be careful to not make the customization options too complicated but still offer enough to allow for an exciting variety. Basti: We always need to keep the overall scope of the development in mind. We want to give you a broad variety of game options, as replay-ability is for the community and for us an important aspect of an Anno game. As you mentioned it already, we need to be careful to not overwhelm players with too many options, as just “adding more” is not always beneficial for the quality of a game. Here comes the Anno Union into play, as the program allows us to present you features to get detailed feedback from our communities. I hope that you will be able to see steam powered machines used in production buildings, as it was the time where steam became a part of agriculture and heavy industry alike. Basti: As mentioned in the last stream, the technological advancements of that era will be represented in the game in various ways. Keep an eye on the blogs of the upcoming weeks, as we will walk you through the core elements of the game and through the advancements of the 19th century. 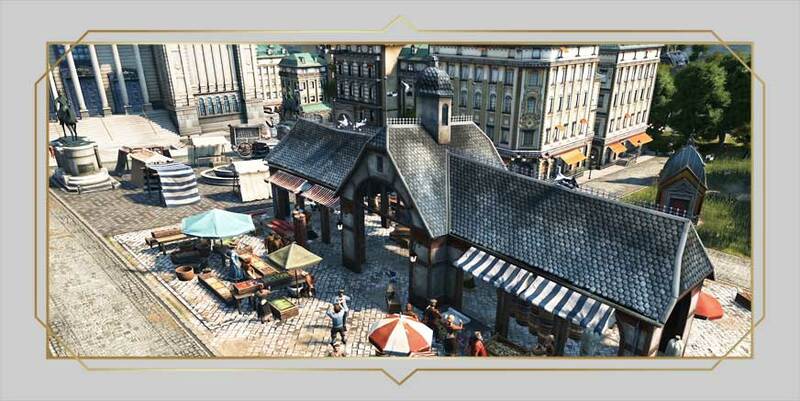 With Anno 1800, progression should feel like a journey through the century. So far, blogs got always released on a Monday or Thursday and between these days, I check the website only on occasionally. How about the option to opt in for a newsletter, which informs you when a new blog is online? Basti: We usually aim for the same frequency of days to publish our blogs but sometimes, the amount of blogs or even the publishing date can varys. We got some good feedback about that during our community roundtable and we plan to bring you a chance to subscribe to the blog with the next web update. It probably will not be a classic newsletter though, as we want to reserve that for important events and topics. I heard that people who work in Ubisoft usually have a Degree (University Degree), but what kind of education people who work in Quality Assurance team exactly have? Dorina: There is no special “tester degree”. We have very different background in QA. Political scientists, Geographers, Sociologists, Media Designers and Computer Specialists. This is important, as these allows us to have a diversified expert view on the product. The different mindsets are incredibly valuable when identifying issues. Beside this, the company permits the testers to get their ISTQB-Certificate (specific software testing certificate). I am curious how you can get into game development yourself, especially how you can land a job in QA or QC? Dorina: Many colleagues in our QA department started in a temporary position and during their time here, they demonstrated their skills and passion for the project. That leads to many QA tester starting as career jumper or newcomer to game development. About difficult issues and the amount of bugs during development…. Dorina: It really depends on the scope, size and the lifecycle of a project. During the various development stages of a game, you encounter a high amount of bugs, which also absolute normal state for every project. Think about it, before a game comes together during Alpha, it is a bare framework of features, which are not fully integrated into the game yet. Bugs are prioritized by the impact on the game and how long it will take to solve them. Based on that evaluation, every issue has an estimate of workhours it will cost to solve it. The real bug hunting becomes interesting in the later stages of the game, when many if of the features get implemented into the client as we come closer to the final release version of the game. From rags to riches – your industrial machine shall never rest when your soot-blackened empire rises into a glorious new era. Manufacturing the first goods is easy enough but soon, you will manage a complex logistical network to ensure a steady flow of resources for your hungry industry. Today, our Game Designers Christian and Sebastian illuminate our lodes and fertility system, which are kicking off a series of posts focusing on the focal point of Anno 1800’s core gameplay: production chains. In the first stages, Anno is dominated by simple production chains, such as establishing a basic food supply. Harvesting natural resources such as capturing fish at your coastline or chopping wood is enough to get things rolling. But soon enough, your small settlement will start to expand and production lines will become more complex. When your production will be evolving into a real industry, it will start to require harder to find resources. Fishing and lumbering won’t be enough anymore, when advanced goods will require you to grow various crops or to tap into the mineral deposits on your island. The growing complexity of the resource management is an important challenge when progressing through the game and soon, you might realize that the conditions on your main island are not enough to support your demanding society. In the real world, every plant has certain requirements in order to grow properly. The right enrichment of minerals in the soil determines the fertility for certain crops and other plants. Additionally, there are other ground and weather conditions which might affect the fertility of the soil. Agriculture makes up a big part of Anno’s production chains, but we simplified the complexity of Mother Nature and translated the concept into our fertility system. 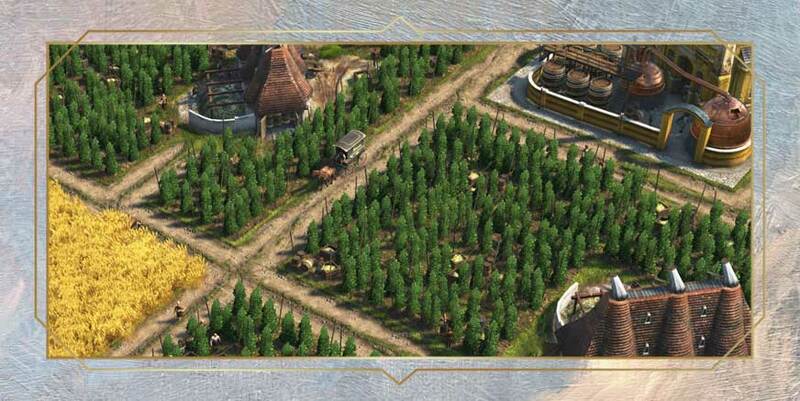 In Anno 1800, not every plant will grow on any island and players have to seek out other isles with the right prerequisites. When progressing, you need to either settle on other islands or establish trading routes in order to improve your production. The scarcity of some resources drives the economic aspect of the game and fuels conflict between different factions that compete over the most interesting islands. Later in the game, we will give you options to have an impact on the fertility of your island. But that is bound to a different feature, which we will highlight in a future blog post. Have a look on our hops production – the beer must flow! In general, lodes work similarly to fertilities with a few additions. Lodes are mineral deposits on your island, with ores like iron found in mountain ranges, while some others, like clay, can be found in a pit rather than a mine. There is one major difference with the fertility system. While you can cultivate crops and other plants at any spot if the needed fertility is provided, you have to construct your mining buildings on fixed deposits, which will get randomly generated with each new game. That means that you have to build your coal mine on an actual lode and cannot freely start mining anywhere. In difference with fertilities, you won’t be able to add or change existing lodes during a session. The location of the lodes on an island play a role in your strategy when designing your city, as they create a natural center for your production districts. Will you create your district effectively around your mining area or will you decide to make use of a clever supply line for your distant factories to avoid having your heavy industry close to the city center? To account for the effort you put in to optimizing your city layout, lodes won’t deplete after time, unlike in Anno 2070. We don’t want to force the player to completely re-arrange an already complex supply line. When is the best moment to expand? Should I rush for other islands to dominate the fight for resources or choose a more laid back approach, where a small outpost or a trading network will do the job? How you tackle on expansion, diplomacy, trade or even the size of your empire, depends on your approach, define your playstyle and let you set your own goals for a match. We want to encourage different approaches and never take away your free will. You should not only decide how you want to play the game, we will also allow you to modify the difficulty of the game based on your preferences. Higher difficulty settings will make resources more rare while easy settings ensure that you don’t have to worry about fertility too much. But that’s it for today, a good foundation for us to build upon in the upcoming weeks. Whether you are a veterans used to fertility and lodes systems or new to it, we are curious to read your feedback in the comments below. 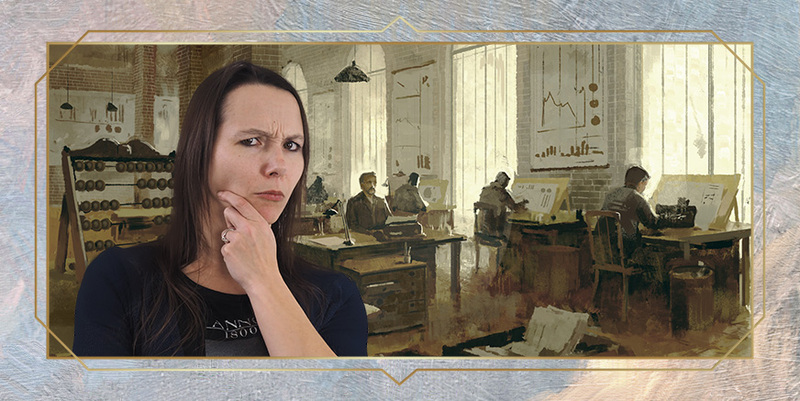 Hi guys, my name is Dorina and I am in charge of the Anno 1800 QA department. I have been working in games for 13 years by now, starting as a student assistant on Anno 1701. A few years later, I got a permanent development testing position and then worked on Anno 2070. It is a great honor to lead the QA team for Anno 1800 and I hope that this blog will give you an interesting look on the diversified tasks of our Quality Assurance team. When it comes to game testing and QA, most gamers out there already seem to have a set opinion about that matter, and often make their voice heard. If you are able to identify bugs in your favorite game, then it surely can’t be that hard for the developers to fix the issue, right? Today, we want to shine a light on the Anno 1800 QA team and give you a look behind the scenes of our daily work, in order to paint a clearer picture of game testing and the complex nature of game development. There is a common trope that working in QA means playing games all day long, and while getting your hands on the game is surely part of the deal, reality is quite different. In fact, spending the day playing the game to check its overall shape and functionalities happens only occasionally. Our day-to-day work consists of specific tasks, where we have to test a certain feature of the game to evaluate its quality or to investigate reported issues. A complex matter, as reproducing a situation can be a demanding task and the causes and effects might often seem totally unrelated at first glance. We get an extensive features list to test for every new development milestone. To reach our goals up to the next big milestone, cooperation in our team and with the feature stakeholders (such as a game designer responsible for said feature) is crucial. Our QA team’s desks are located in the middle of the studio, as we are a central focal point of production, being the team with a broad overview on the entire game. That allows us to build a strong connection with the other teams; you can almost say that QA is the watching eye of the production. People also might get a bit nervous when we spawn at their desk, as that usually means that their features are partly broken in some way. When we start investigating, our analytic skills, experience and knowledge about various development disciplines are our main weapons. While being on a case, the detailed design document (also referred to as DDD) is the QA detective’s handbook. While testing the game or analyzing issues, we always check back with the DDD if the game elements work as intended. As the DDD defines the function of every element in the game, it allows us to create both kinds of test cases: the ones where we check if the game behaves as intended and those where we try to break the system on purpose. We will then compile all data in feedback reports and deliver those to the responsible developer and to the other stakeholders. You all remember how we talked about the trade routes feature in last week’s DevBlog? The DDD describes that feature and all underlying rules of the system in detail, such as how the ships are being added to the routes, but also how menus should work and look, related audio elements, text display, button functionality and much more. When testing that feature, we have to work with the feature checklist to ensure that every single point is properly working. After a bug is fixed, we have to perform further checks to see if the fix breaks any other element of the game. But it is not only about testing if every element works or if there are hidden bugs, we also help to test the balance of the game, from the production chains to the assessment of the difficulty of the battles. We always have to ask ourselves: is it working as intended and is the feature complex enough (or sometimes even too complex)? A task rarely finished in one day, as it involves feedback reporting and ongoing discussions with the responsible developers. When the feature owner then applies changes based on that feedback, it means back to the testing process again. But that is not all- another difference between the QA and QC’s (quality control) work is that we also check the projects globally. If we find out that a tool is not working properly or if there might possibly be a blocker in the production process, we will provide a report to the production team. If we find a bug during the testing process, we will track it down in our bug-tracking tool and forward that report to the responsible game designer. As described before, that kicks off the testing and feedback loop until the issue is resolved. Are you familiar with the saying that goes “No battle plan survives contact with the enemy”? When testing and resolving bugs, there is always a probability that the fix breaks something else in the game. Most of the time, we do not know where a blocker is rooted so we have to find out what’s actually causing the issue first. Games are incredibly complex and there is one general rule: if we fix one bug, it might cause another. When explaining that, I like to refer to the “butterfly effect”, where every flap of a wing can cause something unexpected and kick off a whole series of events. Therefore, before we release an update, we have to test the whole game again to verify that the fix is not breaking something different, which might not seem to be related to the initial issue at first. This is a case-by-case process and the complex nature of a game, where bugs appear often during the development and we have to ensure that this doesn’t block anything in production process, as bug fixing can require hours of work from our coding team. But there is another layer of our work which is not necessarily related to bug testing and fixing. When going through the DDD and observing the game, we might notice that something is missing or might cause gameplay issues based on our experience. If that occurs, we will provide a report including improvement suggestions of what might be missing or what could be changed, in order to improve or to balance the game’s content. The knowledge in our team is hereby of a deciding factor, as we are all different types of players and experience levels. That exact level of variety is important to be able to observe things from as many perspectives as possible. I hope that this blog gave you a good overview of the complex nature of game testing, as it affects every aspect of a game’s production across every development discipline. Working in QA requires enthusiasm, passion and a deep understanding of the games in general, as well as the title you work on. What your takeaway on the role of a professional game tester? Was the topic all too familiar, or did you get new information? I would also love to know if you have ever tested bugs in the past for games or other projects, maybe just as member of a community or even on a semi- or professional level? It requires a passionate and dedicated team of experts to tackle the daily QA challenges of a complex strategy title like Anno 1800. Welcome back to our newest Union Update, today with a short teaser about what’s to come before we move over to answer some of your burning questions. Many of you answered our call for player created islands and your creative submissions have been in the center of internal discussions already. Some of you wondered if the map needs to be a digital drawing and if the use of a specific program is required. To clarify, you can submit a hand drawn map in form of a scan or uploaded photo. When it comes to format, we prefer .JPG or .PNG and the shape/color comparison is not mandatory, it just makes it easier for us to get a quicker idea of the design of your island. We bet that most of you encountered various bugs in your gaming life, is a topic often discussed with passion in communities. For that reason, our QA team invites you to learn one or two things about quality assurance for Anno 1800. If you ever wondered how a QA team operates or how complex the game development really is, we will provide answers in our next DevBlog. With the QA blog, the Behind the Scenes content will take a short break, as we want to highlight a few important game elements in the upcoming weeks. The look behind the scenes will return at a later stage and we can already tell that the Union gave us some cool ideas for future topics. While we take about a short break, there is something called “Rosenmontag” in Germany, basically German carnival. As it seems that the folks around Mainz are really into it (and it is a bank holiday in our county), the usual Union Update will return February 19th. Hi, I would like to know if the game will have a diplomacy feature like the one in 1404. Itt was sad that you were not be able to form an alliance in 2070, as I am a fan of both titles. Basti: Diplomacy will play a role in Anno 1800, an important feature that deserves its own dedicated Devblog, as interactions with NPC’s are a great tool to benefit the games complexity. 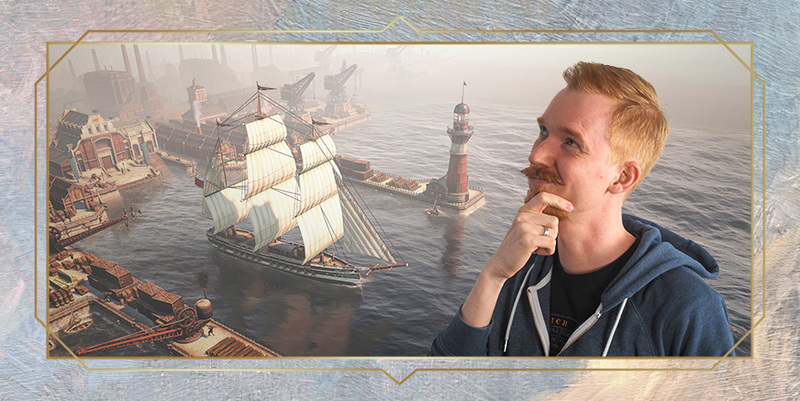 Diplomacy ads not only another gameplay layer, it also encourages different playstyles and gives the cast of Anno 1800s AI depths to each’s unique character and quirks. In 1602 and 1503, coastlines on islands were extremely long, you could place contors nearly anywhere – even several on one island in 1503. With 1701, beaches became way shorter (okay, the oriental islands in 1404 had fairly long beach segments) and the new islands shown for 1800 had all short beach segments. Is there a reason for the limitation, such as technical restrains caused by the trade route system or gameplay reasons (challenges, landing military, island protection etc.)? Basti: There are different factors that play a major role in our island design. Beaches play an important role in the actual gameplay. Limiting the amount of beaches for an island forces the player to think strategically, as the position of a harbor encourages establishing production districts to ensure an effective transport of goods. The amount of beach segments varies from isle to isle and as variety is important for us, many islands will haven even more than two of them. We have not shown many islands as of yet but we are confident that players will like the handcrafted set of distinctive islands Anno 1800 will have to offer. By the way, 1404’s biggest beach segments were roughly 50 grids in size, while Anno 1800 will have beaches with way over 100 grids and with that, allow you to build big and extensive harbors. When it comes to level design, it allows us more visual variety for the coastlines similar to the uneven terrain on the island. If you look back on the islands in 1404, you will notice that the flat islands had only two design elements: mountains and beaches. With the use of cliffs, valleys, plateaus and other elements, we can create more natural looking limitations for Anno 1800. How many faces, surfaces and polygons are used for an average map? Are you allowed to tell us what kind of hardware you use? I am especially interested if you use several CPUs at once, what kind of video card and how much RAM you use. Simon: That is actually hard to put in numbers. We make use of different techniques such as GPU-tessellation, which sends only rough squares (patches) to the GPU, which can further be broken down to triangles when viewed from a distance. That allows us to show every tiny detail from the 3D geometry close up while it uses the simpler triangles when zoomed out. Regarding the hardware, we have workstations with different setups depending on the workspace. We make use of high performance CPUs with several cores, a lot of RAM (usually 64gig) and usually use high end gaming video cards rather than rendering cards. Is Ubisoft open for the idea to release a smaller, trimmed down version of anno 1800 for home consoles, such as the Nintendo Switch? Basti: We want to concentrate on the PC version of Anno 1800, as it is the platform where Anno’s gameplay and complex features shine. We cannot say if there will other versions of the game in future as of yet. We want to invest all of our development energy in a great PC release version of the game. Will it be possible to customize your player profile, as it was the case with Anno 2070 and other Anno games before? I am talking about player color, title, maybe starting ship or skins for different things in game? What kind of options and to what extend is something we could probably demonstrate best in a future stream. How complex will the production chains be? I liked the complexity in Anno 1404, as it was hard to progress far into the game without getting bankrupt. Everything was expensive and the income was not exactly high. Taking the time to produce everything was the main driver for me. The difficulty level and complexity is something I would love to see in Anno 1800. How about a blog where you describe your approach to consumption of production chains which require at least two resources? Basti: We do not want to spoil too much but after we talked about the many aspects of Anno 1800’s logistic system, we will tackle the civilization tiers and their production chains soon. With the next Anno, we want to provide challenges for experienced players while also offer the gameplay freedom to overcome them in various ways. Complexity plays an important role here and the production chains are a core gameplay element of the game. We don’t want to have a too difficult start for new players, especially as veterans usually rush through the early portion of the game with ease. In the spirit of the industrial revolution, we want to raise the complexity when advancing through the tiers. Will there be a visible difference between the citizen tiers? Like a distinctive working class district which is separated from the other classes. Basti: Civilization tiers are more than a game mechanic as they play a leading role to bring the 19th century to life. Keep an eye on the Union, as we will highlight that topic soon. Quick question, do we actually need to register to participate in a focus session, or will active Anno Union members be invited to participate without having first to apply to participate? I haven’t seen anywhere to apply yet, am I missing something or have applications not started? Hi, my name is Sebastian and I am one of the Game Designers for Anno 1800. I have been part of the Anno Team since about two and a half years now and today I want to share some information with you on something we have been working on for a while now, the trade routes! 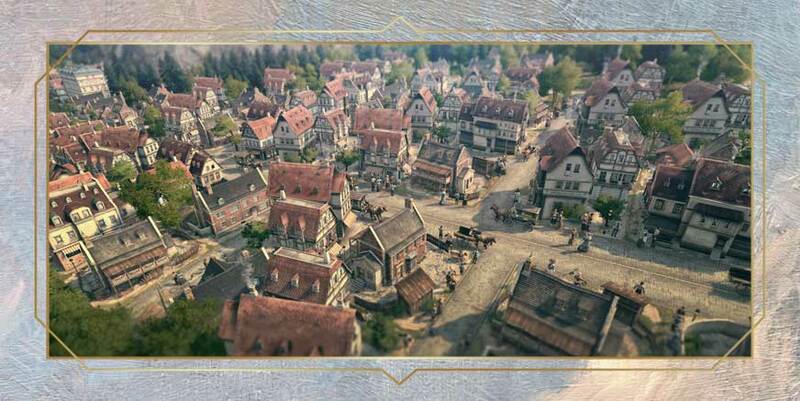 More than just a city builder, Anno 1800 is also a game about growing a small settlement to a real economic empire. Over the course of the game, the needs of your capital island will raise and you are in charge to fuel your hungry industry and fulfill the demands of your citizens. Your main island can be a demanding beast and at some point, you have to expand to other islands to support your advancing metropole or to buy needed goods from other characters. With trade routes, you can connect your islands with a transport network to ensure a steady flow of resources. “These pesky citizens! It seems whatever you do, they always ask for more and not exactly in a polite manner.” To fulfill their demand for beer, we could rely on trading but we decide to get our own production going. Unfortunately, the needed hops does not want to grow on our island so we have to establish our beer production line on our outpost, which is located on a nearby island. Of course, you do not want to order your ships back and forth manually, so you setup a trade route to ship the harvested hop or even the brewed beer over automatically. The beer will flow and hopefully make them happy for at least a while. As you know, we want to bring back more complex features to the next title in the series. Instead of the more recent and simpler iteration of the trade routes, you will be able to make use of two different systems this time. One for the players who like to modify, tinker and optimize their routes for maximum efficiency and another one for simpler and faster but potentially less efficient routes. Let’s start with the more complex system. As this one is much closer to the ones from 1701, 1404 and 2070 you could call it the “classic trade route system”. It allows you to transport goods between your islands or to trade with other parties automatically. To give you an idea about the complexity of the system, here is an overview over most of the available options: You can freely set stations and define which goods should be loaded and unloaded by your ships. You will again be able to assign multiple ships to a route and each of them will be able to transport multiple goods. There is no limitation to the amount of routes you can create. Of course, you can name your routes for better overview and for those who do not like to come up with route names themselves we implemented an automatic naming system that should give you an idea of what this route is doing. The routes overview will also display the most common goods transported by a route. Here a design study, or so called mockup of the trading route feature. Not representative of the final version in the game. With several ships following one route, you might encounter the situation that one first ship is fully loaded with goods at a harbor but there is not enough left to load the second one. Instead of leaving with an almost empty storage, you can order the ship to wait until the full amount of goods is loaded. Additionally if a ship arrives at the destination and wants to unload its cargo, but the harbor has no space to load up your ships delivery, you can command your vessel to throw stuff over board in order to make space for the goods you would like to load. These two options called “Wait until full” and “Throw overboard” – very creative, I know – can be configured for every station separately. When creating your trade route, you trust your ships’ captains to find their way across the sea on their own. With no further instructions, your ships will naturally take the shortest route, which might be problematic as this does not factor in hostile areas or wind direction. It might be an option to guard your ships against loot hungry pirates but maybe avoiding their territory might be the wiser strategy in the first place. To account for this we will also bring back waypoints for routes. When two consecutive stations are assigned, the route automatically draws a line between them and the player can add and move a waypoint to change the path of the ships. Visibility and complexity go hand in hand. The UI elements shown are not final. None of this is limited to islands on your current session; you will be able to expand your trade routes to other sessions as well. What we are aiming for is a complex system, which favors the freedom of the player. It can also be seen as a challenge for seasoned Anno and strategy player, as it brings room for error and mismanagement back into the game. However, sometimes even the most seasoned logistics expert needs a fast and easy solution to get things done to take care of other, more pressing matters. For that, we added a second system to the game. If you know the routes system from 2205, the charter routes will sound familiar. They are a much lighter system that allows you to rent ships in order to transport goods between your own islands. Easier to handle but also more limited than their big brother, they can only transport one type of good in one direction between two of your islands. This is one ship per route. The chartered trading ship cannot be controlled manually but can be attacked by opponents or other AI characters. Chartered ships also have higher upkeep costs than your own trading vessels – in the end the captains need to pay their crew and want to make some profit too. As a result, players who spend time creating their own routes save money and players who are in a rush or don’t care so much about the money can save time. Here an early version of the charter route menu. Amount of items and general loading capacities in this blog are also not representative. Supporting your ever-growing cities is part of the fun and with these two systems, we want to give you the tools to create an impressive and world-spanning economic empire. And with this matter at hand, I would love to know what kind of player you are. Are you a transport tycoon who builds a highly efficient transport network with trade routes? Are you willing to invest a bit more in charter routes in order to concentrate fully on your city planning? Or will you mix and match the systems as you like?